Eager to not only keep up with the news but write the headlines yourself? The best journalism schools will teach you how to meet deadlines in and out of the classroom. We investigated the schools where students get hands-on experience in the classroom, opportunities to work for on-campus publications, internships that take you to news hotspots and advice from professionals in the field and on campus. Whether you want to live in the heart of NYC or the Heartland, these top journalism schools will put you at the center of news-worthy events. Check out who made the cut for CM’s top 10 journalism schools of 2019. NYU alumni go on to write for the New York Times and the Huffington Post. And its Big Apple campus makes New York University a hot spot for journalism. NYU’s journalism program focuses on both theory and the practice of journalism so that students leave with experience in class and on the field. You can also go to the Arthur L. Carter Journalism Institute’s dedicated career center for help finding internships focused on building resources and connections to the numerous publications and outlets in the city. Sign up for classes like Production and Publication, Journalism Ethics, and First Amendment Law. “Students at NYU not only learn the time-honored techniques of crafting well-reported and well-written stories, but they also learn data journalism, podcasting, photojournalism and videography to be well-equipped to land good jobs,” said Meryl Gordon, associate professor and director of magazine writing. In a five-hour reporting and writing class, students learn how to cover various subjects learning numerous styles of articles such as profiles, news stories, and the question and answer format. NYU can also send you abroad, offering a journalism-specific program in Ghana. Students find plenty of ways to practice using their voice at UT Austin. From the on-campus newspaper The Daily Texan, to FM radio stations KUT and KUTX and even the lifestyle publication Longhorn Life, students pick what type of content they want to work on and share on campus. In the digital innovation class, a capstone course offered each semester, students learn how to bring digital products to fruition, market their ideas and build a portfolio in the process. Students can also to study abroad with programs offered in Australia, China, Chezch Republic and Austria. At UT Austin, you will learn the tricks of the trade and enter the workforce with evidence to prove it. Unsure if you want to share the news using a pen, microphone or behind a news desk? Those interested in journalism at Penn State can choose between digital and print, broadcast, and photojournalism tracks. These tracks focus on preparing students to become writers, reporters, editors and photographers with classes such as news media ethics, news writing and reporting, and principles of multimedia journalism. Students can work on the Centre Country Report, an award winning student-run newscast. As for help finding a job or internship, Penn State’s career services hosts three communications-focused internship fairs a year in order for students to experience work in the field and receive credit through COMM 495. Gear up for opportunities of a lifetime working for news hubs like CNN, CBS News, the NFL and The Los Angeles Times. Northwestern’s journalism program ensures students will make front-page bylines. 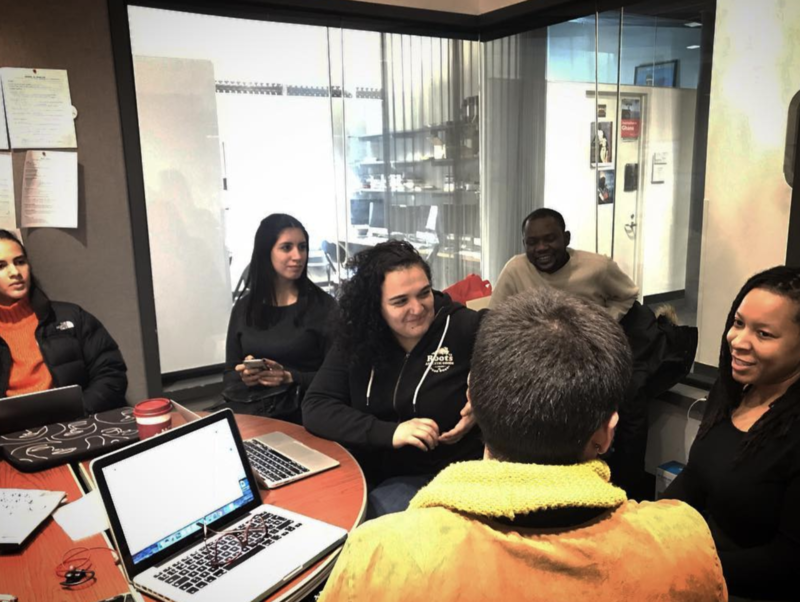 Students at Northwestern’s Medill School of Journalism, Media, Integrated Marketing Communications take advantage of the Knight Lab. This center partners with the McCormick School of Engineering to give journalism students a glimpse of how technology has changed the field. Northwestern takes journalism students beyond Chicago to explore other markets with Medill on the Hill (in Washington, D.C.) and Medill in San Francisco. “Students experiment with emerging media, explore global journalism and prepare not only to work in a changing media world but to lead it,” Director of Marketing and Communications Sara Brazael said. If these opportunities don’t satisfy your hunger for news at a global scale, Northwestern journalism students can also take an opportunity to study abroad and even experience working for publications such as Al Jazeera English in Doha or La Nacion in Buenos Aires during a global journalism residency. Back in North America, students get busy writing headlines for The Daily Northwestern, the on-campus newspaper. Students can also investigate other electives such as Documentary, Media Design and Investigative Journalism to further pinpoint the specifics of their journalistic passions. Take advantage of other offerings such as taking a double major, earning an Integrated Marketing Certificate and attending events with guest speakers such as Sally Kestin, a Pulitzer Prize-winning reporter for the South Florida Sun Sentinel and George R.R. Martin. Eager to build your portfolio from your dorm room? At Mizzou, students interested in journalism find plenty of opportunities to get involved with student publications ranging from the on-campus newspaper The Maneater, to The Global Journalist, a print and broadcasting publisher that reports on world issues. You can get on the air with KBIA-FM, the mid-Missouri’s NPR station. Plus, Mizzou’s Walter William Scholars Program offers selected students a renewable scholarship directly from the School of Journalism plus placement in a Freshman Interest Group, a faculty mentor and $1,000 for global programs. William Scholars also get automatic admission to a one-year B.J./M.A. program (assuming they complete the application and maintain a 3.25 journalism GPA) which allows students to complete a graduate degree in one year rather than two. Once junior year comes around, journalism students choose from over 30 different focuses like Data Journalism, Magazine Editing, Multimedia Producing, Sports Journalism and more. And if none of those 30 choices fit your interests, then you can meet with faculty to design a course plan perfect for you under the Individually Designed Interest Area. With professional organizations like the American Society of News Editors and Investigative Reporters and Editors, Mizzou students don’t have to do much investigating to find plenty of great ways to get involved on campus while earning hands-on experience in the journalism field. As a part of the Mizzou Mafia, you’ll soon learn why Mizzou grads love to hire other Mizzou grads. Dip your toe into journalism (and the pool to beat the Tempe heat) at Arizona State University. Students at ASU’s Walter Cronkite School of Journalism and Mass Communication get the opportunity to work on Arizona PBS, the largest media outlet operated by a journalism school. If this doesn’t keep you busy with headlines and deadlines, you can also work at Blaze Radio 1330 AM, a radio station broadcasting everything from sports to news and of course, music. Numerous other professional programs exist for students to focus in on a certain branch of journalism such as the Cronkite News – Digital Production, Phoenix Bureau, Washington Bureau or the L.A. Sports Bureau. In a professional program, you will gain hands on experience contributing to broadcast platforms such as Arizona PBS and the Reynolds Business Bureau. ASU students get one-on-one guidance with the Cronkite Mentorship program which matches freshman with professionals in the field. The career service boasts relationships with leaders in the industry who work with the Phoenix Business Journal, CBS 5 and La Voz. ASU will prepare you to enter the professional world with experiences both in and out of the classroom. To get an even more focused experience, students can decide on a specialization within the major such as sports journalism, business journalism and Latino journalism. Those with a specialization in sports journalism will want to take advantage of the Sports Knowledge Lab. You can also get hands on experience in the Public Relations Lab and the Television Production and Graphics Lab. Newsflash—networking is a must for aspiring journalists. The University of Florida’s College of Journalism & Communication’s Journalism & Ambassadors programs ensures students work closely with faculty, hosts events with alumni and professionals and even matches students with professional mentors. To build relationships on campus, the pathfinder network matches you with other students for support and mentorship within the program. Other than a network of support and mentors, UF offers students a chance to gain experience and wisdom of their own through student organizations such as Alpha PRoductions, Florida’s largest student-run public relations firm. Other organizations include the Association for Women in Sports Media, the National Association of Black Journalists and the National Broadcasting Society. “Getting real-world experience is critical while still in school and one of the hallmarks of the UF College of Journalism and Communications,” said executive director of external relations Randy Bennett. “ We have seven media properties, all housed within the college, including the local PBS, NPR and ESP affiliates, where students get real–world experience in broadcast and digital. We recently opened a bureau in our state capital where students provide much needed state government news both statewide and nationally.” You can also start writing headlines of your own for The Independent Florida Alligator. With all of these networking opportunities and chances to create your own work on campus, it’s no wonder Gators have continued on to work for National Geographic, The Washington Post and ESPN. Graduates of Stanford’s journalism programs go on to work for organizations like The Washington Post, Google News, ESPN, Politico, Bloomberg Businessweek and The New York Times. At Stanford, you’ll gain the knowledge to join their ranks through your experience behind a desk—both in the classroom and the workplace. Stanford’s journalism program emphasizes essentials like beat reporting, data frame of mind, DSLR videography and investigative reporting techniques, as well as software programs like Adobe, WordPress and Final Cut Pro. You might take classes on becoming a watchdog, building a news application or virtual reality journalism. Your journalism thesis project will have you focus in and research on a topic of your choice. You will also get a chance to build your portfolio by working for one of the student media and professional news partners, such as the Peninsula Press or KQED. Or start covering news right on campus by contributing to the student-run newspaper, The Stanford Daily. Studying at Stanford will prepare you to enter the professional world, using the latest technology and meeting deadlines to share stories in the modern age. UNC’s School of Media and Journalism has one of the top research facilities exploring the relationship between technology and journalism. The program meets all nine standards according to the Accrediting Council on Education in Journalism and Mass Communication, an agency dedicated to high standards in journalism and mass communications education. Undergraduate students can apply to take part in the undergraduate journalism program once they complete 45 credit hours and are in good academic standing. You can get your feet wet in the journalism world by writing for the student newspaper, The Daily Tar Heel. Want to travel for spring break while still getting credit? UNC’s journalism program can take you far and wide with immersive student experiences such as documentary multimedia storytelling in Medellín, Colombia or the MJ Career Services student networking trip to Silicon Valley and San Francisco. When the time comes to find an internship or plan for post-grad life, the MJ career center is available to help students with every step of the career search process. Some opportunities posted include real-time reporting with the The Charlotte Observer or a freelance reporting for Business Insider. Students don’t just report news at American University, they live and witness it. Even more, students at American University work towards getting their bylines in publications like The Washington Post, USA TODAY, Politico, NBC4 and National Public Radio. Students learn about the journalism field in classes like Field Article Reporting, Digitial Audio Production and Backpack Documentary. Narrow your studies and focus on a concentration like investigative, political, social justice, emerging media or broadcast journalism. Connections to big players in the industry lie not only in internship or job opportunities with alumni like Frances Fragos Townsen, a political contributor for The Situation Room and CNN and Al Koken, a freelance journalist and sportscaster. Current faculty work as correspondents, editors and have been recognized for their work. For example, Professor Charles Lewis is a national investigative journalist, best-selling author and founder of the Center for Public Integrity and the International Consortium of Investigative Journalists—two Pulitzer Prize-winning nonprofit news organizations. Students selected to participate in the Dean’s Internship get incredible opportunities to receive recognition while working with national and international publications such as The Washington Post and USA Today. Dean’s Interns often build relationships with these organizations to return for a job after graduation and continue to strengthen the connection with American University. Sydney is a senior at the University of Denver studying Film Studies and Production. She enjoys hiking, photography and wishes that Leslie Knope was her best friend.